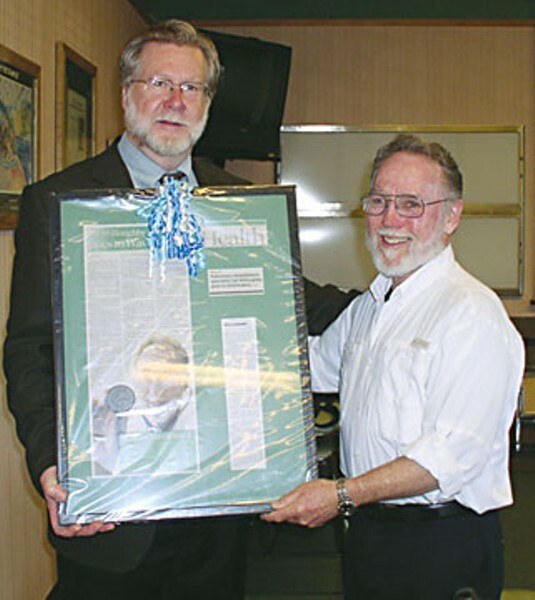 Mad River Hospital CEO Doug Shaw (left) awards a plaque to Carl Willoughby. Photo by Vicky Sleight. Allie Hostler, public information officer for the Hoopa Valley Tribe, is very worried about the hazardous conditions in Hoopa caused by the smoke from the large wildfires, which have been burning in the hills above eastern Humboldt County. Carl Willoughby, a respiratory therapist at Mad River Community Hospital, said that the smoke is a huge problem for people in affected areas with respiratory illnesses. “People with significant respiratory diseases should see a doctor if they are having respiratory distress due to the smoke,” he said. Willoughby has been a respiratory therapist for 32 years. He’s been running the Pulmonary Rehab clinic at Mad River Community Hospital since 1996. In 2005 he was nationally recognized with the American Association for Respiratory Care's annual Continuing Care & Rehabilitation Specialty Practitioner of the Year Award. He lobbied in Washington D.C. in 2007 for a national coverage policy that would ensure that individuals would not be denied or limited access to pulmonary rehabilitation services because of Medicare status. Recently, he successfully lobbied Congress, after a three year struggle, to override the President’s veto on a Medicare bill protecting doctors and hospitals from a 10.6 percent cut to their reimbursement rates when treating Medicare patients. There are currently no Air Quality Alerts in the Eureka area. Willow Creek is on and off alert status, and residents are advised to check air quality status periodically. As of July 31, Hoopa, Orleans, Weitchpec and surrounding areas may reach very unhealthy conditions and concentrations of smoke may vary. Residents are advised to take precautions to minimize exposure. “The most heavily impacted areas in Humboldt County are Orleans, Somes Bar, Ruth, Weitchpec, Willow Creek and Hoopa,” said Jason Davis, Planning and Air Monitoring Manager at the North Coast Unified Air Quality Management District. Residents in affected areas are doing the best they can to minimize exposure to the hazardous smoke. “It’s a bummer that our summer is being taken over by smoke and wildfires,” said Hostler. For advice about how to handle smoky conditions, visit the North Coast Unified Air Quality Management District's website: ncuaqmd.org.